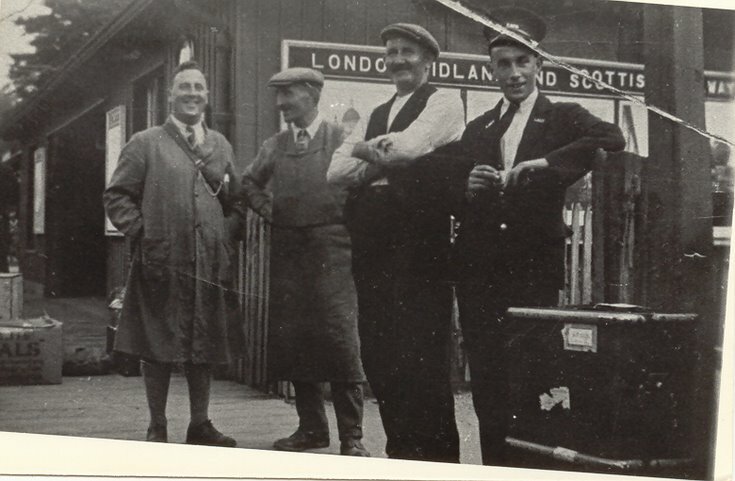 Black and white photo (itself a copy) of a group of four men including railway staff at Dornoch station. The man on the left is a young Willie Wright who owned a dairy in Dornoch and in the 1940s and 1950s sold milk in Embo from a small van. His dairy, behind “Grants the Butcher”, was also famous for its ice-cream which was served by his daughter Beattie Wright. The milk was not packaged as it is today but was expertly measured out to customers from large metal churns in the back of the van. Willie during all of this task was keeping his customers amused with his banter. These customers came to buy milk carrying their own milk cans or pails. Even in these years Wille Wright dressed as shown here but by then wore leather leggings instead of the long stocking as shown here. I even think he even used the exact same money bag and had it slung in the exact same way. He was a very jovial man and was always smiling. Well not always...I remember a group of young Embo boys in the early 1950s placing a small cardboard box with a stone inside it on the tar of cnoc hill just up from the Embo station. As bad luck would have it Willie Wright hit it with his van and there was milk all over the place. There is another version of this photo but Willie/Bill is not named on it, photo No: 1432 - Thank you for your comment. The image has been amended. - Administrator.